Actually, I’m pretty sure there’s no law requiring me to do so. And that’s fortunate. Because I am a fan of baseball, and I very much do not love Derek Jeter. No offense to Captain Intangibles and his many fans inside and outside of New York’s five boroughs, but I root for one of the 29 Major League Baseball teams that doesn’t have unlimited piles of cash at its disposal. And thus, I’ve seen many a promising season for my local nine turn into a pile of charred ashes at the hands of the New York Yankees. And more often than not, it’s been Derek Jeter holding the match that winds up incinerating my hopes and dreams. Is Derek Jeter a fine ballplayer? Sure. Does he deserve the many accolades thrown his way? Probably. Is he a role model for today’s youth? I guess. Do I secretly fantasize about running him over with a tank any time he’s facing an Oakland pitcher? Macworld’s legal team has suggested I not answer that. Anyhow, the embodiment of True Yankeedom has lent his name and gallingly handsome visage to Derek Jeter Real Baseball, a $3 baseball simulator from Gameloft. The iPhone and iPod touch game is noteworthy for a rather dubious accomplishment—it’s the first time that Jeter, a 10-time All Star and five-time World Champion, has ever been associated with mediocrity. Throwing Smoke: Pitching is one of the high points of Derek Jeter Real Baseball. The game makes good use of the iPhone’s controls to incorporate strategy into keeping opposing hitters off balance. That may sound harsh, but once you play the game you'll notice that—despite some lifelike graphics and clever controls—Real Baseball comes up short on the realism front. Every time you launch the game, you’re treated to a short video touting Derek Jeter’s many on-the-field achievements. There doesn’t seem to be a way to disable the video in the game’s options, but you can bug out after a few seconds. That’s not the end of the Jeter hagiography, though; load screens feature sayings from Chairman Jeter about the importance of hard work, discipline, and humility in the face of multitudes of reporters and fans ready to sing hosannahs to you for the most routine of plays. Observant players will note that these images of Jeter feature him bedecked in the familiar Yankee pinstripes, but that all traces of the Yankees’ logo have been scrubbed out of existence. That’s because Real Baseball may have Derek Jeter’s considerable blessing, but it does not have any tie-in with Major League Baseball or its players union. The game features made-up teams and generic players. That lack of authenticity may be a deal-killer for some baseball fans, but it didn’t bother me. I was more put off by the game’s insistence that every lineup had to feature the catcher leading off, the first baseman batting second, and so on, all the way down to the right fielder hitting eighth. Alter the lineup—the catcher for the Oakland Chips is a bit of a slowpoke, so I decided to switch his place in the order with the faster left fielder—and Real Baseball not only swaps their batting positions but their fielding spots as well. The catcher always bats lead off in Real Baseball’s world. It may make the game easier to organize, but it detracts from the realism. You can play a quick game of one, three, six, or nine innings, or you can play an entire season, lasting 14, 28, or 56 games. The game’s App Store description promises a 162-game season, but I couldn’t find that option when testing version 1.0.6 of the game. That’s not a complaint—a 14-game season was long enough to hold my interest. If you’d like to skip the drudgery of a regular season, you can jump ahead to a three-round playoff mode. You’re playing against the computer—there’s no multiplayer mode, either via Wi-Fi or pass-and-play. The game offers three degrees of difficulty—rookie, veteran, and all-star. I couldn’t discern a difference between the first two levels; in fact, playing in veteran mode, I achieved my greatest triumph, pummeling the New York team led by the One True Jeter. All Star mode proved a little bit trickier—your computerized opponent hits the ball harder, fields better, and makes a lot fewer mistakes. When it’s your turn to bat, you’ve got two options for swinging the lumber—touch, in which you tap the screen, and slide, in which you move a slider back and forth to swing the bat. In both cases, you’re timing your swing to make contact with the ball as it hits the strike zone. I found touch to be the better control scheme, but both are easy enough to master, if not exactly engaging. In addition to swinging away, you can also make your batters bunt; sabermatricians will be delighted to know that bunting is as unproductive a strategy in Real Baseball as it is in real-life. With location and pitch now selected, you then have to tap to determine your pitch’s speed and accuracy. Perfectly position your pitch at the right speed, and you’re as unhittable as Sandy Koufax was in his prime. I really appreciated how Real Baseball takes advantage of the iPhone’s accelerometer for aiming your pitch, and I was impressed by how you could use an inside fastball to set the batter up to flail away at a change-up on the subsequent pitch. It really approximates the strategy that goes into an actual baseball game. Fielding and base-running don’t fare nearly as well. Controlling fielders has been the bane of many a baseball video game, and the problems become especially complex on a mobile device. Gameloft tries to deal with the issue by taking control of your fielders—all you have to do is pick which base they throw to. It makes the game a little dull, actually, as you’re reduced to the role of spectator when your fielders chase after a ball. Here, again, Real Baseball fails to live up to its name—you can hit a solid single to the outfield, and the right fielder is still able to throw you out at first base. Your opponent can smash a ball off the wall in the deepest part of the ballpark, and you’re able to hold the batter to a single—assuming that the computer doesn’t send the runner to second. Often times, it does, and you’re able to turn a base hit into an easy out. I’ve had innings where my pitcher has been battered from pillar to post, only to record three quick outs after my not-so-intelligent computerized opponent makes foolish outs on the basepaths. If you play in season mode, Real Baseball tracks your team’s statistics, though it doesn’t calculate the more interesting numbers like batting average, on-base percentage, or slugging percentage. Every time a batter comes to the plate, the game will flash his statistics. Unfortunately, these stats have nothing to do with the season you’re playing; rather, they’re numbers Real Baseball concocts to give you an idea of what kind of player you’re facing. Even more confusing, apart from the home run and stolen base totals, the stats have no bearing on the player’s actual ability. I’ve seen pitchers with a .000 batting average record solid base hits. Hey, Lefty: You'd expect Derek Jeter to be a monster player in a game that bears his name. But you might not expect the normally right-handed Jeter to bat as a left-hander. 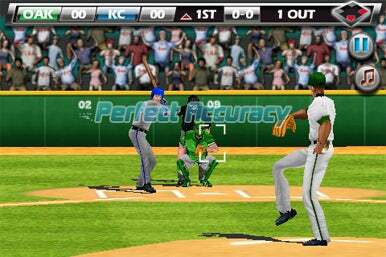 In addition to the season and playoff modes, Real Baseball also features a home-run derby mode that pales in comparison to a game like Homerun Battle 3D. In Real Baseball’s version, you’re merely timing your swings and hoping that you connect enough to send the baseball over the fences. As contests last three rounds, the action can get pretty monotonous. If, like New York Yankee fans, you prefer contests where the outcome is determined well in advance, you can always opt to be Derek Jeter in home run contest mode. While the Yankees shortstop has never hit more than 24 home runs in a season—not even in the new bandbox George Steinbrenner built—in this game, he’s the sort of home run-hitting monster who makes Hank Aaron look like a pop-fly hitting benchwarmer. Interestingly, in this game, Jeter also bats from the left side of the plate; as every schoolboy knows, Jeter’s a righty, not a southpaw in real life. And perhaps that seemingly insignificant detail helps explain why Derek Jeter Real Baseball fails to live up to the standard the Yankee shortstop has set throughout his storied career. Maybe this is Bizarro Derek Jeter, where everything is the opposite of how it is in our world. 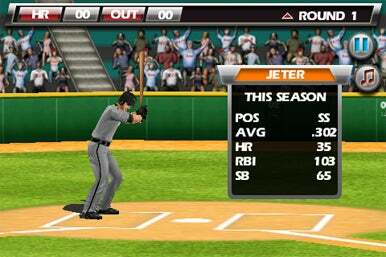 Just as the real Derek Jeter may be one of baseball’s top stars, his virtual counterpart—and his mobile game—fail to make the grade.